Ms. Gretchen Lovewell is the Program Manager for Mote Marine Laboratory's Stranding Investigations Program (SIP) . She has been active in the stranding network since 1999 where she was a student at University of North Carolina Wilmington. 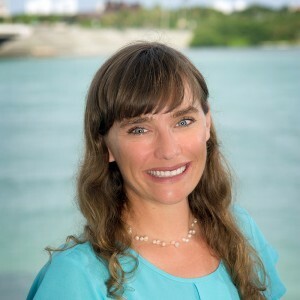 Gretchen has been in a leadership role since 2003, first as North Carolina s state stranding coordinator for NOAA Fisheries and currently as the SIP Program Manager. Since 1999, Gretchen has responded to over 40 different species of marine mammals and sea turtles and hundreds of stranding responses. In addition to her stranding work, Gretchen has participated in aerial and vessel surveys for marine mammals, is a Level 3 first responder for large whale disentanglement and has participated in multiple dolphin health assessments and rescues. This work has led to several collaborators on peer-reviewed scientific papers, presentations and reports. Amaral, A. R., Lovewell, G., Coelho, M.M., Amato, G., and Rosenbaum, H.C. Hybrid speciation in a marine mammal: the Clymene dolphin (Stenella clymene). PLoS ONE 9(1): e83645. dol:10.1371/journal.pone.0083645 Byrd, B. L., Hohn, A. A., Lovewell, G. N., Altman, K., Barco, S., Friedlaender, A., Harms, C., Martone, P., McLellan, W.A., Pabst, D.A., Thayer, V.G., and Moore, K. T. Strandings illustrate marine mammal biodiversity and human impacts off the coast of North Carolina, USA. Fish. Bull. 112:1-23. January 2014 Begeman, L., St. Leger, J. A., Blyde, D. J., Jauniaus, T.P., Lair, S., Lovewell, G. N., Raverty, S., Seibel, H., Siebert, U., Staggs, L., Martelli, P., and Keesler, R. I. Instestinal volvulus in cetaceans. Veterinary Pathology. Veterinary Pathology 50:4 590-596 July 2013 Delynn, R. A., Lovewell, G. N., Wells, R. S., and Early, G. Congenital Scoliosis in a Bottlenose Dolphin. Journal of Wildlife Diseases 41:4 979-983 October 2011 Fire, S.E., Wanga, Z., Leighfield, T.A., Morton, S.L., McFee, W.E., McLellan, W.A., Litaker, R.W., Tester, P.A., Hohn, A.H., Lovewell G.N., Harms,C.A., Rotstein, D.S., Barco, S.G., Costidis, A., Sheppard, B., Bossart, G.D., Stolen, M., Noke Durden, W., and Van Dolah, F.M. Domoic acid exposure in pygmy and dwarf sperm whales (Kogia spp.) from southeastern and mid-Atlantic U.S. waters. Harmful Algae 8 658-664, 2009. Harms, C. A., Maggi, R. G., Breitschwerdt, E. B., Clemons-hevis, C. L., Solangi, M., Rotstein, D. S., Fair, P. A., Hansen, L. J.,Hohn, A. A., Lovewell, G. N., McLellan W. A., Pabst, D. A., Rowles, T. K., Schwacke, L. H., Towsend, F. I., and Wells, R. S. Bartonella species detection in captive, stranded and free-ranging cetaceans.Veternary Research 39:59, 2008. Byrd, B.L., Hohn, A.H., Munden, F.H., Lovewell, G.N., and LoPiccolo, R.L. Changes in Commercial Fishing Regulations Affect Bottlenose Dolphin (Tursiops truncatus) Strandings. Fishery Bulletin 106:72-81 January 2008. Harms, C.A., Lovewell, G.N., Rotstein, D.S., Hyperglycemic Cataracts in a Live-Stranded Minke Whale (Balaenoptera acutorostrata) Calf. Marine Mammal Science. Dec 2007. Rotstein, D.S., Harms, C.A., Lovewell, G.N., Hohn, A.H. Gastric leiomyoma in a free-living Atlantic bottlenose dolphin (Tursiops truncatus). The Veterinary Record, January 2007; 160: 130-131.